Considering how easy it is to search through all the news and discussion across the Web in real-time, how come we can’t do the same with the multitude of TV channels available? Well, today, if you have an iPad and you’re in the US, you can, thanks to an impressive new app called Boxfish Live Guide. 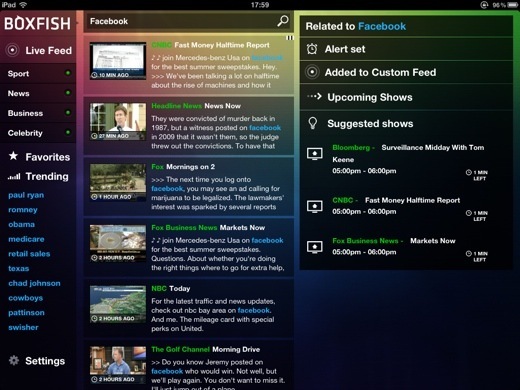 Boxfish turns your iPad into a real-time search engine for TV. Want to catch the latest mentions of your favorite sports team, find out who’s mentioning Barack Obama right now, or get an alert when the company you work for appears on TV? It’s all possible. Once you’re set up (a case of entering your zipcode, selecting your TV provider and optionally letting the app detect your set-top box), you’re free to explore a variety of feeds tracking what’s being mentioned right now in the worlds of news, sport, business and celebrity news. As with Twitter, you can see currently trending topics (‘Paul Ryan’, ‘Romney’ and ‘Obama’ all top the list right now, unsurprisingly) and you can browse individual channels, too. The freetext search function is the most powerful feature here, though. Any keyword can be entered, and you’ll get regular updates with where that word is being mentioned. You can set up alerts so that you don’t miss upcoming mentions too, although these are one-shot deals – you’ll have to set up the alert again if you want to be notified of another mention. If you have a supported DirecTV or TiVo box, you can even change channel right from the app (support for more TV providers, and deeper DVR support, is planned for the future). So, how does this all work? By indexing the closed caption text broadcast in sync with the TV shows themselves. 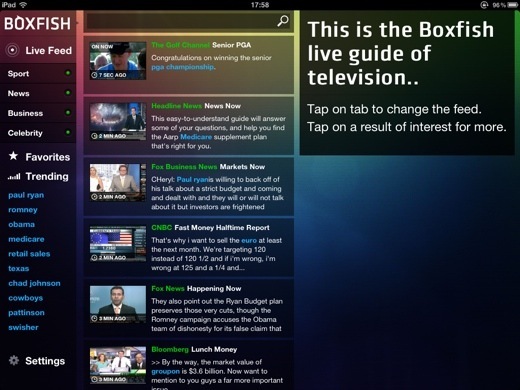 In essence, Boxfish has turned TV into a vast real-time data source. The Palo Alto-based startup was founded in London in December 2010 before relocating to California in early 2011. It took on a £3m Series A round led by T-Venture, the Venture Capital arm of Deutsche Telekom, in July last year. After trying a simple Google-style search bar, the team found that users responded far better to a ‘Tweetdeck for TV’ approach. Although US-only for now, Boxfish is already indexing UK and Irish TV channels in preparation for future expansion. iPhone and Android versions of the app are also in the works. It’s worth noting that UK startup Zeebox is doing similar real-time monitoring of what’s being mentioned on TV, but at present that only manifests itself in the form of ‘Zeetags’ that link topics discussed to Wikipedia entries and other data – there’s no ability to search yet. The Boxfish app is free, but as with so many other startups these days, the value here is in the data, and it’s likely that media companies will be keen to pay to tap into it.